As most doctors will say, healthcare is about helping patients, not making money. However, these two goals aren’t as separate as some would assume. In order to help their patients, healthcare providers need to buy equipment, pay salaries, and spend money to maintain an effective, efficient customer experience. Revenue is what makes healthcare work, so preserving revenue should be a main priority for healthcare administrators. For help with revenue preservation, Calvaruso’s team uses Experian Health’s revenue cycle management tools. 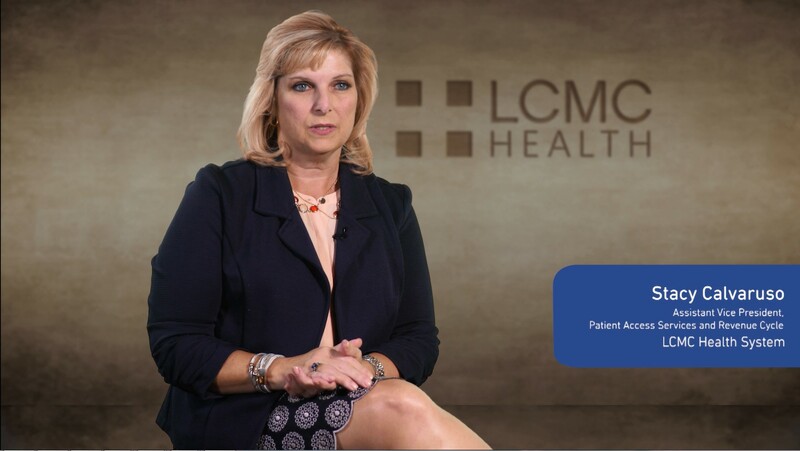 The full suite of Experian Health’s revenue management products help LCMC Health facilitate patient access, manage contracts, process and submit claims, and streamline collections. Here’s a closer look at how Experian Health approaches each stage of the revenue preservation process. With 86 percent of leading medical practices seeing an increase in payer prior authorization, having accurate and comprehensive patient data is crucial to getting patients the treatment they need with fewer denials from insurers. Experian Health can help by verifying patient information at the point of service. From there, automated software coordinates patient data across all connected facilities so customers, doctors, and insurers are better informed about possible treatment options and how much they’re likely to cost, eliminating any surprises in the payment or collections process. According to Calvaruso, a transparent process helps to prevent repeated work, which is a major cause of revenue loss. “Instead of calling a patient after the fact about a denial or incorrect insurance information, we’re able to call them on the front end to let them know that we’ve verified their benefits, we know what the estimate of their out-of-pocket payment is going to be, we’ve talked to their doctor, and we’re ready for them to come and have these services,” she says. Experian Health’s Patient Access tools make it quick and easy to find the right information and avoid miscommunications and delays that affect revenue preservation. Hospital staff will be grateful for the lightened workflow and improved outcomes for both customers and administrators. One of the most common clogs in revenue collection comes from unclear contract management. Without the right data to analyze contract compliance, hospitals will struggle to get accurate payments from insurers and customers. Calvaruso says that one of the cornerstones of her revenue preservation philosophy is reducing the avoidable denials; Experian Health’s contract management tools can analyze and audit contracts to ensure payer compliance and clarify anything that could lead to such a denial. Experian Health’s contract management tools also provide patients with more accurate estimates of treatment costs. One recent survey of 54 hospitals found that getting a price estimate is a frustrating process for patients; another poll found that 46 percent of younger patients aren’t paying their full bill at the point of service because they didn’t have an accurate cost estimate. Having accurate contract management data can make a big difference at both the point of service and in later payment collections. Experian Health’s contract management tools can not only increase the revenue a hospital collects, but they can also improve the financial experience and build better relationships with customers and insurers. Everybody makes mistakes, but given the amount of stress that healthcare providers are under, it’s more likely that they’ll make mistakes on routine paperwork like claims forms, which can lead to the kind of rework that hospitals loathe and that eats away at revenue. Experian Health’s solutions helped Calvaruso develop that type of process. ClaimSource helps organizations prioritize the claims that need immediate attention, which saves time and reduces the number of tardy claim submissions. To avoid errors in the claims themselves, Experian Health’s Claims Scrubber® makes sure clean claims are submitted the first time, eliminating the dreaded rework. Submitting new claims after denials is aggravating, but bad debt write-offs are even more harmful to revenue preservation — it’s money that the organization will never see, no matter how much more work is put in. The only way to ensure accurate collections is to minimize the risk of denial in the first place. As Calvaruso says, a key component of preserving revenue is moving back-office work to the front end. For collections, this means accurately verifying patient identity and analyzing litigation risks. Of course, not every situation can be accounted for, and there will always be issues with collections, Experian Health’s collections solutions make it easier for organizations to prioritize their past-due accounts and pursue them effectively. No healthcare organization will ever receive 100 percent of the revenue it’s due, but taking the right steps to preserve revenue can mitigate much of the loss and keep things running smoothly. With healthy revenue management, healthcare providers can better help the people who need them most.